Summary: The day of Caenum’s Inking is fast approaching, and he’s more than a little terrified about the profession his Ink might force him into. Prepared to leave his family and childhood friend, Caenum is ready to flee the life he loves for a future of his own choosing when his plans go awry. Will he be able to control his own fate, or will the magic-fearing Citadel achieve their ultimate goal of controlling his destiny for him? We have a long history with Eric Smith here at Bibliomantics, from his social media work with Quirk Books to his self-published novel about writer’s block (Textual Healing), to his non-fiction guide to dating the geek way — all the way until now with his first foray into young adult fiction, a digital tale snagged by the imprint Bloomsbury Spark. Inked has everything you expect from a young adult dystopia: romance (with accompanying sexual tension), ridiculously prophetic names, a high-stakes rebellion and a protagonist who blacks out just when things are getting good — although something has me convinced that Smith is making a tongue-in-cheek nod to other YA tropes rather than writing clichés in a number of these instances. Where Smith excels is his world building. His protagonist, Caenum (who is terrified of reaching adulthood and being Inked) lives in Frosthaven, a town in the Realm controlled by the Citadel, a ruling government which orders all citizens to be Inked with tattoos (Ink) all over their bodies when they come of age. Like the Cutie Marks in “My Little Pony,” the magical Ink one wears on their skin shows what they are proficient in and in turn determines a person’s future career path (even if said career path happens to be assassin). It’s also somewhat sentient. Take Caenum’s friend Dreya (Dreyalla) Allbloom, who has a way with plants. As a result of her talents, her Ink manifests as flowers and plants which bloom and die with the changing of the seasons, react to her moods and even recommends what plants will grow best in her greenhouse. Unlike Cutie Marks however, Smith takes the time to actually explain how Ink works. Trust me, it’s not pretty. Despite living in a world where citizens are expected to get magical tattoos that reveal their future professions and proficiencies, the citizens and the Citadel are frightened of capital “M” magic. Which seems especially silly considering that their Ink is Magic and they use magical runes on weapons to hinder Magic in others. Magical persons are known as Conduits and their powers (which are different from Conduit to Conduit) may remain dormant or become accelerated with the addition of Ink Magic. To punish them for their differences (and other things I won’t delve into), the Citadel puts these Conduits through a process called Extraction, where their Magic is removed from them via machine, a very steampunk machine. Again, not pretty. Thankfully, there is a safe zone located in the Realm known as the Sanctuary that they can escape to. If they’re not captured by Citadel Guards or the many shadowy figures who work for them first. 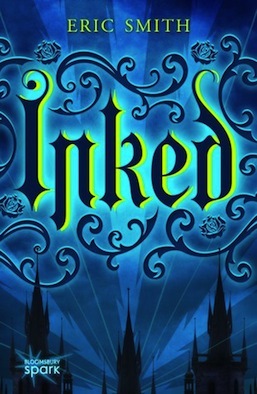 As with any good young adult dystopia, Inked explores the tricky issue of social classes, with Conduits and Unprinted citizens (those without Ink) being considered lesser than the Inked members of society. Caenum himself is actually frowned upon by his neighbors the Allblooms for his mysterious orphan status and not the fact that his name literally means mud. Kind of stuck up for a gardening family with the surname Allbloom. I would have loved to get more information about the villainous Citadel (besides obvious allusions to how evil the hub of the Realm is what with their gladiator battles and all), but really I’m nitpicking since Smith was careful to wrap up any lingering loose ends. Eric Smith’s Inked is currently available for pre-order at a very affordable $3.82, and while you’re on his author page, make sure you take a look at his other fine literary offerings. I highly recommend Textual Healing (because puns).